I had quite low expectations of this month's duo but once more Eaglemoss have obliterated my mental negativity. 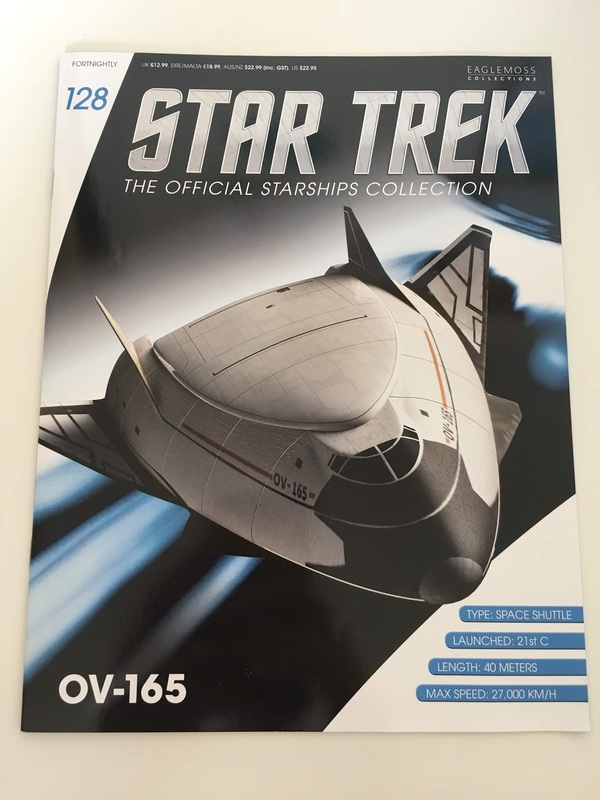 Shown only in the opening titles of Enterprise, the OV-165 space plane may rank as the chronologically earliest ship to be a part of the series since it "fits" between the OV-101 space shuttle Enterprise and the Phoenix. 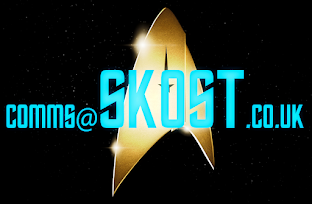 Now from memory there's nothing else from this far back in Star Trek space flight history. 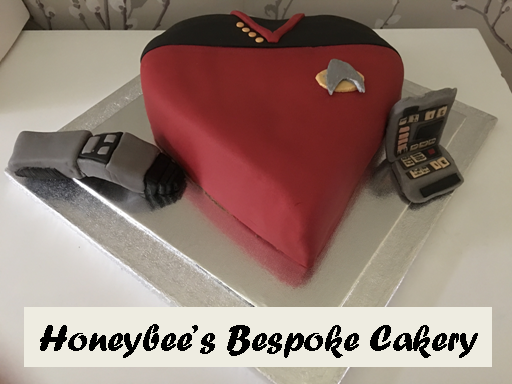 This is an absolute winner - no doubt about it - and the real killer is that mine arrived a little scuffed in a couple of places as you'll spot from the pics but on a positive note it doesn't ruin how great this "historic" craft is. The panelling effects around the nose are a big indicator of how this craft has been influenced by the earlier NASA Space Shuttle. It's such a smooth finish to the paintwork here as well with the lines separating the sections of the nose perfectly aligned to each other as they curve around the hull. On mine there is a minor blemish on the tip but I'm bearing with it! Up to the blackened cockpit windows (same colour as the black nose sections mind) and the OV-165 really opens up, literally widening out into the main body of the hull. The panelling also gets more detailed as we move towards the rear of the space plane with the exterior decorated with a tiled effect finish across the upper hull and cargo bay doors. The darker grey segments work to break up the colour nicely but are not too overpowering against the white base coat. Spot too that there are actually only a few major panel lines worked into the body of the craft running across the hull left to right while the tiling effect on top appears to be a large transfer stretching from the cockpit to the very rear. 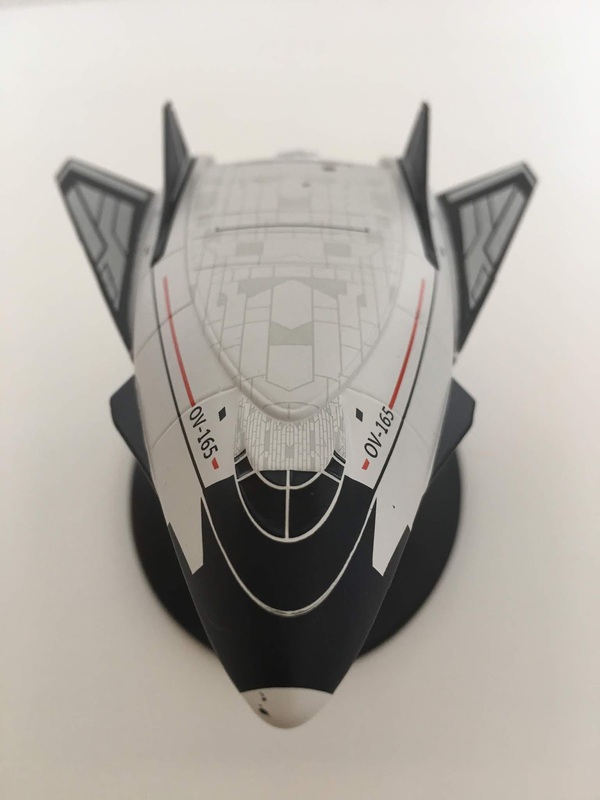 Nor am I disappointed that it is a decal because it's perfectly placed and even more impressive are the wrinkle free lines which run down either side of the hull in black and red. Both are precisely parallel to the other with the lower black ones meeting up exactly with the rear stabiliser fins, themselves edged in black. Those fins rise almost majestically from the main hull and the craftwork on this one is blindingly good with it all appearing to be one piece as far as the topside of OV-165 goes. The fin edges are crisp, the paintwork excellent and the grey marking is again razor sharp at every angle. In fact that marking is recessed into the fins which makes it even more impressively finished. 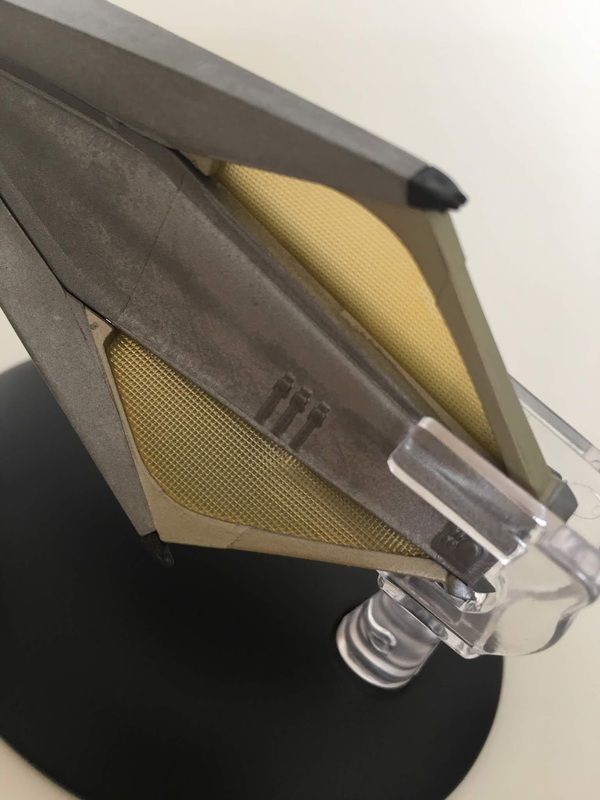 The fins aren't part of the top metallic section of the ship and are instead inserts into the hull and match up with the plastic underside and wings. The fit on one of the two fins isn't quite flush with the starboard side one just sitting a little high. There's a smidge of a roughe edge to the front while the port fin runs smoothly into the main body of the OV-165. To the back there is a sweeping drop and here I've spotted some of the paint on my model is missing to the port side on the base white coat. The sweeping hull plates here are a single grey with the metal allowing some great definition on the ridged sections. 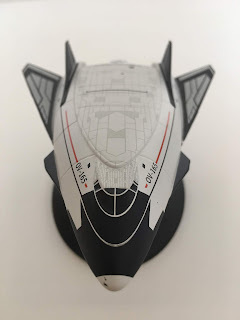 Now according to the plan views in the magazine, the aerospike engines which power the ship are located at either side of this sweeping piece but on the model there is no clear indication of where they are since the entire bottom of the ship is a single black coat. The stand fit is a single clip here which slides onto the swept section of the hull to the back. It's a steady grip with a stand that fits together pretty well. It's the only place that the ship could be positioned on the stand and makes the OV-165 look even more fantastic. The two lifting wings at the sides continue that grey/black panel combination as with the vertical fins and my only gripe with the single plastic bottom is that there are some pock marks in the middle of mine. I kind of understand why there's no detail on the underside - just as there isn't much on the finished SS Emmette since it was only ever intended to be viewed from the rear. 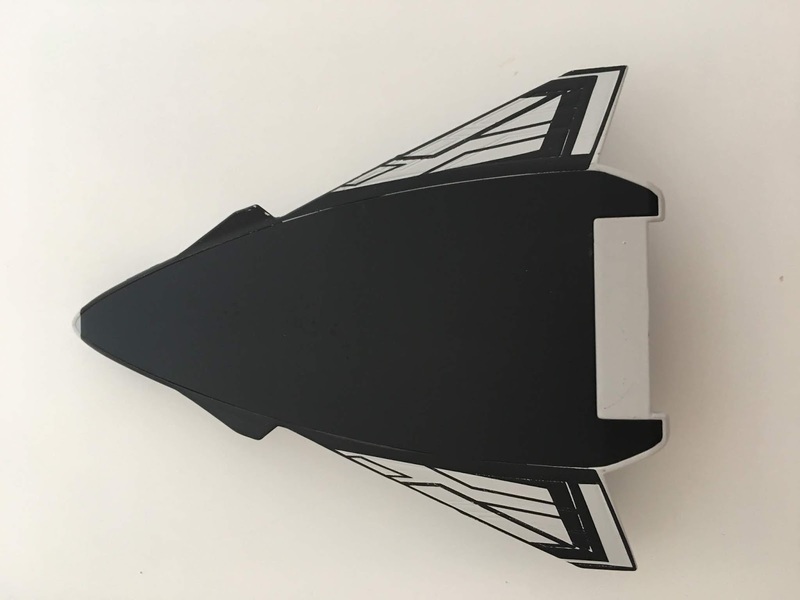 Issue 128 offers a brief but insightful look at the "in universe" facts of the space plane and its unique propulsion system which uses the hull rather than the wings to take flight. The points here do make it a very natural successor to the NASA space shuttle and by proxy screams out that the collection has to include the OV-101 Enterprise orbiter at some point soon. Awesome plan views with just that printing error of VX-165 on one side!!! 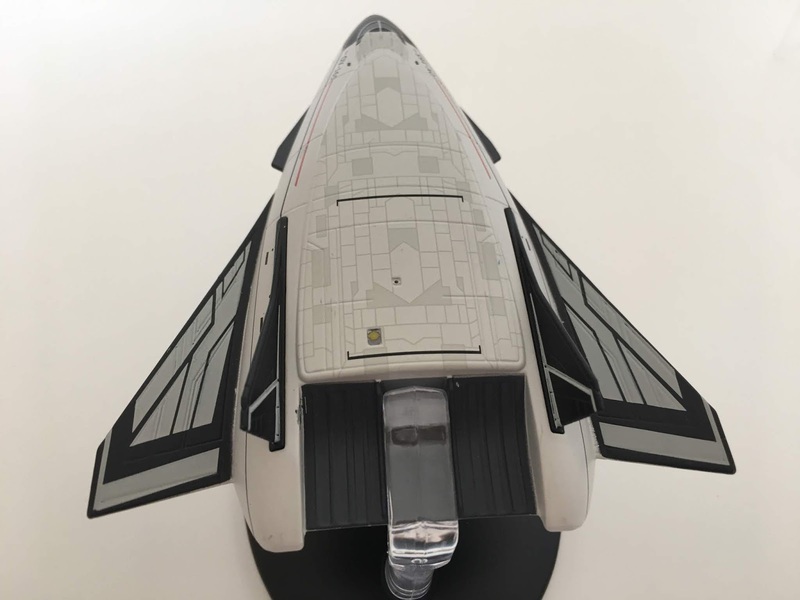 John Eaves' designs are poured over here with a good selection of ideas that attempted to bridge the gap between the Phoenix and the classic shuttle design from the 1980's. 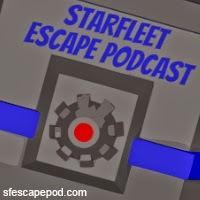 Finally we have a section reviewing the visual effects used for the Enterprise pilot Broken Bow. 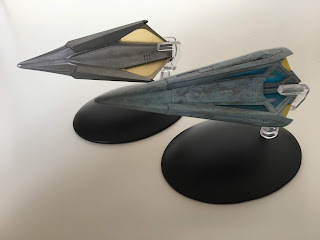 Lots of good information here with a look at everything from the launch of the NX-01 - the most detailed CG ship ever created (to that point) for Star Trek to animating the tongues for the alien women during the bar scene on Rigel X later in the story. Second up to the plate is a new remastered craft from The Original Series. I would have loved to see the classic form of this ship but for now we're getting the updated Tholian Webspinner. 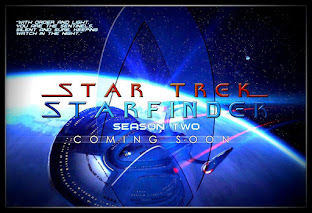 Based on the Enterprise 22nd Century version spied during the second season of the show, the Webspinner is built around a central metallic core. 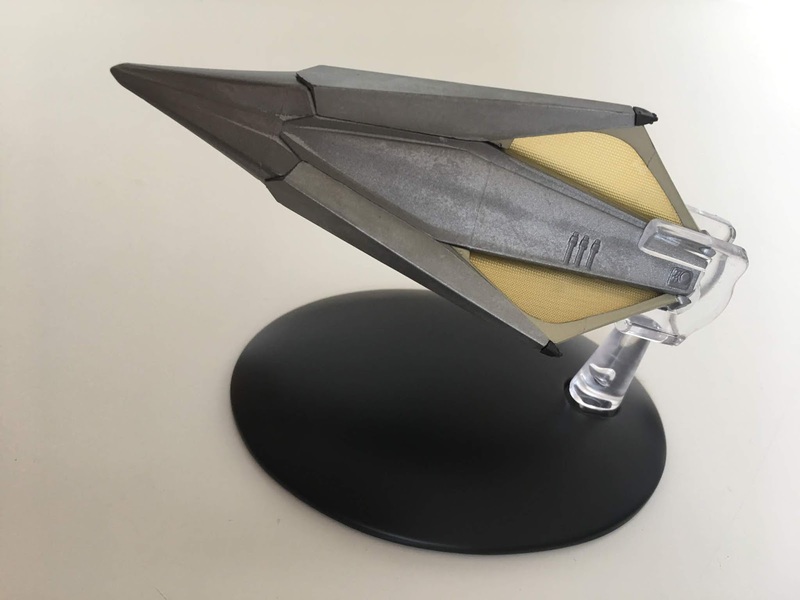 One of the simplest ship designs for some time, the Tholian craft has only very slight detailing on that central section which is in keeping with the plain design of the 1960's iteration. For note the tripe lines on two sides of the ship do help indicate which way is "up" on this one. The main piece of detailing is to the "spear tip" nose where there is some raised hull panelling which leads back up into the three fin-like appendages which branch out to the engines. The protruding hull sections that lead to the translucent engine covers are plastic and one of the sections on my Webspinner is loose, revealing the simple covering is a single section that runs over the engine to the back above the web-spinning port. Those three translucent engine covers are finished with a grated effect but I would have liked to have seen them more aglow with that red/orange fiery finish that was seen on the screen as this colour doesn't do the ship any justice on a shelf. The metal finish is also a bit too clean for my liking and could have benefited from a little more mottling than we get on the finished item here. The web-spinning port at the rear lacks depth to it as well which is clearly a restriction of the model-making process and can't be avoided but at least you can tell where it is. 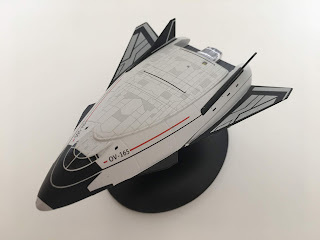 The fitting for the stand is the same as for the Enterprise 22nd Century version, slotting over the rear and providing that "flying" illusion. It's a solid grip and the ship being angled backwards means there's little chance of it sliding out spear-point first. Ok, over to the magazine for ship number 129 and it's interesting to see that the concept here is that the Tholian ships haven't advanced that much over the course of a century, proving more than a match for the NX-01 but being easily bettered by the NCC-1701. The xenophobic Tholians are a cracking race from The Original Series and having both this and the earlier edition fleshes out their background as much as possible. We also have a lot more focus on The Tholian Web (no complaints there) and how it all links in to In a Mirror, Darkly. For those big fans of the collection, this also provides you with the Enterprise, Defiant and Webspinner photo op now all three are available. 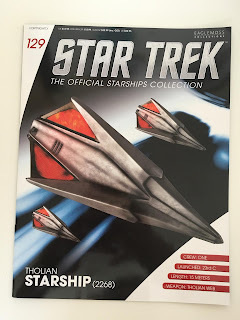 Designing the Tholian Ship is rather short but tells the tale that the budget for the remastered episodes had run out, leaving those in charge to take the Enterprise webspinner and "update" it for the 23rd Century. Indeed, putting the two side by side you can see a lot of similar lines. Finally we have six pages discovering Star Trek at the Smithsonian, revisiting the exhibition and the array of props that were displayed from The Original Series from the medical instruments used by Doctor McCoy through to the cumbersome - and difficult to get out of - environmental suits from The Tholian Web. Having seen one of them I have to agree they look awful to extract yourself from! SO that's it from this month for regular issues. These two are a lot better in the flesh but of the pair I have to say there's more of a yearning to keep the OV-165 on the shelf a lot longer than the Tholian ship. 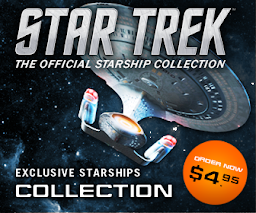 Note to Ben, I think you need to do some of the classic classic ships as well especially this one! 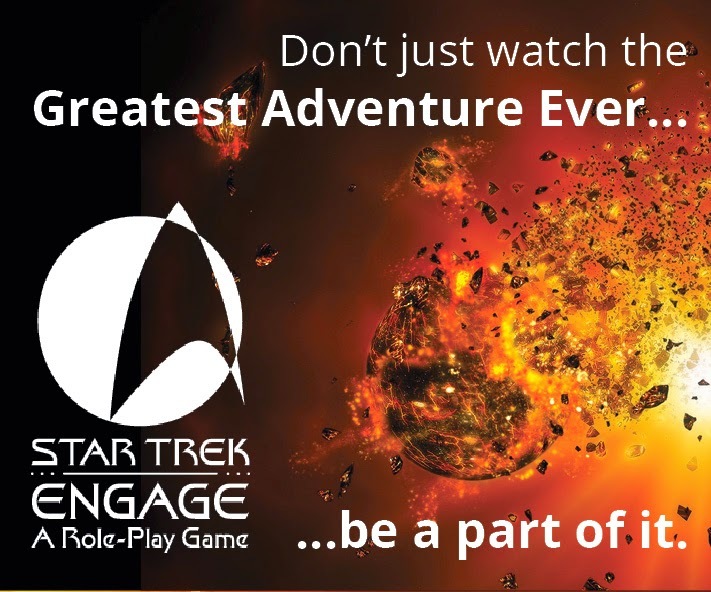 Loving the Enterprise titles group? Impressed with the remastered Tholians? Let me know your thoughts below!